The Gorkha National Liberation Front today waved a copy of a statement of the ministry of home affairs to claim that the Gorkha Janmukti Morcha indulged in doublespeak in Darjeeling and Delhi with regard to the statehood. 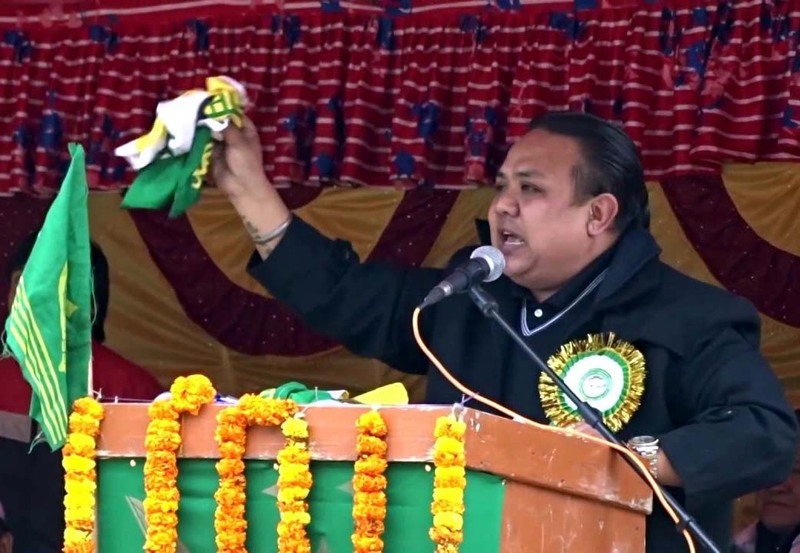 Morcha general secretary Roshan Giri had said in Delhi yesterday that the Centre was in favour of forming a committee to examine the Gorkhaland demand. He made the claim after a meeting between Bimal Guurng-led GTA delegation and central ministers, which was chaired by the Union home minister, Rajnath Singh. Neeraj Zimba, the spokesman for the GNLF, said: "In Darjeeling, Bimal Gurung thunders and says he will only talk on the issue of Gorkhaland. In Delhi, the talks on Gorkhaland are ambiguous but there is a clear mention of other issues like funds for the GTA." Zimba today waved a copy of the statement of the Union home ministry, which was released by the Press Information Bureau following the meeting between the GTA delegation and the central ministers. The PIB release states: "During the meeting, it was decided to sympathetically examine and appropriately consider the long pending demands of the Gorkhas, the Adivasis and other people of Darjeeling district and the Dooars region." Zimba said the statement didn't talk about one issue. "The statement talks about 'issues'. It is in plural. The 'issues' could be different. Apart from talking about examining the long pending demands of the Gorkhas, it also talks of issues of 'other people of Darjeeling district. How can we expect something on statehood from a party that is heading a government when it cannot even use the word Gorkhaland. Or is it that the Morcha cannot make the BJP write the word Gorkhaland," said Zimba. He went on: "There is no mention of a committee in the press release. Even if a committee is formed, nothing much will happen as it will only be a delaying tactic to win elections. Had a commission been set up, it could have been welcomed." The GNLF alleged that the Morcha was more interested in funds. "The press release states that of the Rs 600 crore financial assistance to the GTA, Rs 465 crore has already been released and the balance of Rs 135 crore would be given this financial year. A party which states that it would only talk on Gorkhaland ends up talking about funds," said the GNLF leader. Giri today said the issue of funds had been raised by the Centre. "They (Centre) raised the issue. The issue of statehood has been clearly mentioned in the release vis-à-vis the long pending demands of the Gorkhas. When the Union home minister and tribal minister are present at the meeting, issues like panchayat polls, tribal status and central university are bound to be discussed," said Giri. The release states that the tenure of the committee to examine the demand of ST status to 11 communities of the region had been extended by four months.